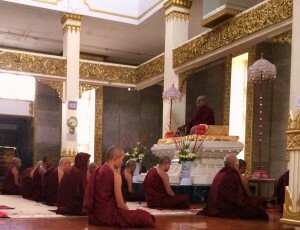 Mahasi Sayadaw’s systematic approach to insight meditation has been practiced with unbroken continuity at MSY since 1947 with as many as 500 yogis meditating at a given time. The Center’s senior preceptor​ ​(Sayadaw)​ ​will be overseeing the special Retreats​.​ The​ ​Sayadaw will deliver discourses throughout the Retreat periods. Regularly scheduled individual sessions with Sayadaw and his​ ​Senior​ ​Meditation Teacher Assistants provide continuity and guidance for yogis throughout their practice at MSY. Mr. Alan Clements (a former Buddhist monk at the Mahasi Centre). Dr. Ingrid Jordt (a former Buddhist nun at the Mahasi Centre). Dr. Jeannine Davies (long-time practitioner in the Mahasi tradition). Practice at Mahasi Sasana Yeiktha is a rare and precious opportunity. Yogis are asked to enter their retreat with open-heartedness, to practice with purpose and dignity, and to display kindness and high-respect for all during their time at the Center. The Ven. Mahasi Sayadaw of Myanmar is considered one of the most influential meditation masters of modern times. His interest in vipassana meditation took him to Thaton where he practiced vipassana meditation for four months under the guidance of Mingun Jetavan Sayadaw U Narada (1868-1955). In June 1941, at the age of 37 years, he passed with distinction the government-held scriptural examinations and thus received the Dhamma teacher title (Sasanadhaja Siripavara Dhammacariya). During the Second World War, while the Ven. Mahasi Sayadaw was residing at Seikkhun village he wrote the ‘Manual of Vipassana Meditation’ (Vipassana Shunyi Kyan), a fundamental work of two volumes on the theory and practice of Vipassana meditation, which was first published in 1942. Being a prolific writer the Ven. Mahasi Sayadaw has more than 70 books related to vipassana meditation to his credit, many of which have been translated into English. Upon the invitation of Sir U Thwin and the Buddha Sasana Nuggaha Organization (BSNO) Mahasi Sayadaw took up residence at a newly established meditation center in Yangon, on November 10, 1949, which soon was named as Mahasi Meditation Center (Mahasi Sasana Yeiktha). There Mahasi Sayadaw began teaching Vipassana meditation to a rapidly increasing number of meditators on December 4, 1949. During the Sixth Buddhist Council (Chattha Sangayana), which was held between 1954 and 1956, Mahasi Sayadaw served with much skill as the ‘Chief Questioner’ (pucchaka), final editor (osana sodhaka), and ‘national admonisher’ (ovadacariya), while Tipitakadhara Sayadaw U Vicittasarabhivamsa served as the ‘answerer’ (chattha sangitivisajjakaka). During his lifetime the Ven. Mahasi Sayadaw was instrumental in establishing over 300 Mahasi meditation centers in Burma. Today, there are over 600 branch centers. The Ven. 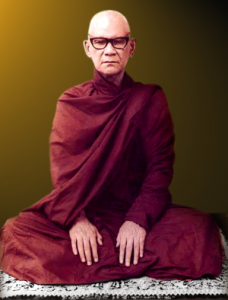 Mahasi Sayadaw undertook many Dhamma missions to foreign countries during which he planted the seed of Buddhist teachings and especially vipassana meditation. Among the countries he visited are India, Sri Lanka, Nepal, Singapore, Malaysia, Thailand, Vietnam, Cambodia, Laos, Indonesia, Japan and other Asian countries. His Dhamma missions also took him to North America and the United Kingdom, France (Tournon and Paris, 1979) and Holland. As a result, a keen interest in the Mahasi approach to mindfulness meditation developed and led to the establishment of numerous Mahasi meditation centers outside of Burma. On August 14, 1982, having spent 58 rains (vassa) as a Buddhist monk, the Ven. Mahasi Sayadaw at the age of 78 passed away. During a life selflessly devoted to the spread of the Dhamma he had helped thousands upon thousands onto the path of insight and liberation.